3rd Annual 9U/10U/11U/12U/13U Baseball Tournament ! The Clarksburg KEYS 9U & 10U & 11U & 12U & 13U teams are holding a Baseball Tournament. 9U & 11 U on July 8th-10th, 2016, with a Home Run Derby on Friday July 8th. The 10U & 12U & 13U tournament will be July 15th-17th 2016, with a Home Run Derby on Friday July 15th. The Tournament will be made up of a minimum of eight teams in each division, additional teams will be added with interest. All games will be played in Clarksburg. Each team will be guaranteed 3 games. Saturday games will be Round Robin style. On Sunday, teams will be reseeded and will play for Tournament Championship. Trophies will be awarded to the KEYS for Soldiers Champions. Tournament Fees are $500 (9U/10U) and $575 (11U/12U/13U) and include the Umpires and game balls. A portion of proceeds from the tournament will go to the KEYS for Soldiers charities Operation Second Chance and Fisher House. This baseball tournament is the final event of the "KEYS for Soldiers" celebration in Clarksburg. The KEYS are honoring the American Soldier by hanging 1500 Yellow Ribbons around their baseball fields. The tournament is more than just about playing games, but to educate our children that we are able to play baseball because the sacrifice of our soldiers. The Tournament will be an enrichment for the players and their families. We Have T-Shirt Orders due on Friday June 24th to Allow last minute teams and some additional requests to place orders. 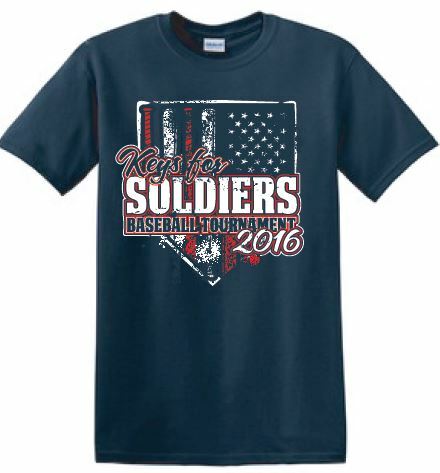 Our tournament t-shirts were very popular last year. T-shirts are imprinted with a completely new design this year. 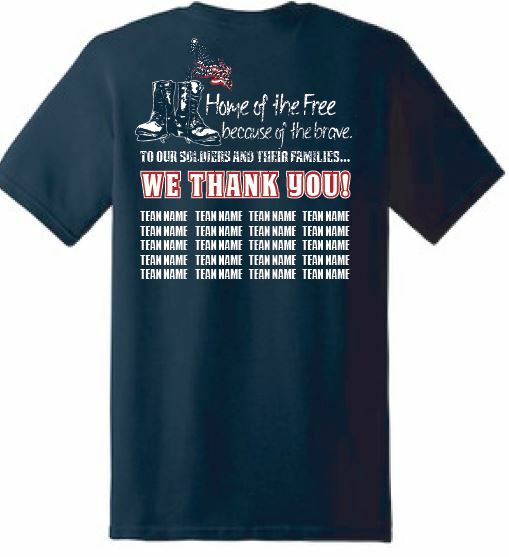 All participating teams are listed by age division on the back of the shirt and this year the t-shirt itself will be Navy blue in color and moisture wick.By pre-ordering shirts for your team you guarantee that you will (1) receive t-shirts and (2) get the exact sizes that you require. In addition, pre-ordered shirts are only $16 per shirt, instead of $25 if purchased at the tournament event site (i.e. 35% discount). To assist you with your sizing, the shirts are made of 100% preshrunk. ( some shrink will happen) Available sizes include YM, YL, YXL, AS, AM, AL, AXL, A2XL. Please poll your players, parents, siblings, coaches, relatives and fans and determine how many tournament shirts you would like to pre-order along with their desired sizing. Compile the data and go to Online Forms found at http://www.clarksburgkeys.com/ and submit your team tournament t-shirt pre-order form. If you need to amend your order at any point in time (prior to the deadline of course) please feel free to do so. We will use the most recent pre-order form that you submit. We do not require payment when you submit your pre-order for t-shirts. Your team’s t-shirts will be available for pick-up on Saturday (7/9) and (7/16) and Sunday (7/10) and (7/17) at Ovid Hazen Wells Park (12001 Skylark Rd. Clarksburg, MD. 20871). Proceed to the tournament tent set up along the right field fence line of Field # 2. When you pick up your t-shirts, you should be prepared to make full payment in the form of cash and/or check in an amount equal to the total shirt order amount calculated as total # of t-shirts ordered x $16/shirt + $2 for all size adult XXL - XXLshirts ordered. Checks (if any) should be made payable to Clarksburg Baseball. The KEYS for Soldiers Flyer, Registration Form, Roster Form and Rules documents can be found in the "Handouts" tab on the left menu.